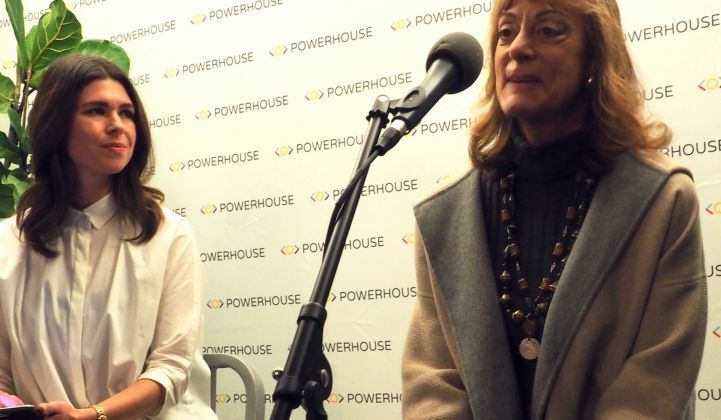 Cleantech VC Nancy Pfund believes that savvy policy chops lead to better investing choices. Nancy Pfund is perhaps the most recognizable venture capitalist in the clean energy space. Before she raised multi-hundred-million-dollar funds at her firm, DBL Partners, and made early investments in the likes of Tesla, SolarCity, Off Grid Electric, PowerLight, NEXTracker and Advanced Microgrid Solutions, Pfund had to start somewhere. "In college, I didn't know what a venture capitalist was -- I was an anthropology major," she said at the January recording of Watt It Takes, the live podcast from GTM and Powerhouse in which cleantech founders tell their stories. Here are some of Pfund's tips and tricks for getting ahead as a clean energy investor. For the full conversation, check out the podcast below. And then read on for more insight from Nancy. The next live Watt It Takes taping will feature Sara Ross, co-founder and CEO of Sungage Financial, who turned her frustration at the lack of rooftop solar financing into a business opportunity -- with a little help from her daughter's college savings fund. It's happening Wednesday, February 21 at Powerhouse in Oakland. Click here for tickets. Pfund first affected energy policy when she was in college. She attended Stanford during the gas crisis, when drivers spent hours lined up to buy gasoline. At the time, gas stations weren't required to post their prices, which meant customers could end up paying even more than they would have expected. "You might get gouged, but you didn't want to leave after waiting in line for two hours," she said. That prompted a research project. Pfund studied gasoline pricing across stations that did and did not post their prices. She found that the stations that publicized their pricing were indeed cheaper. That finding caught the attention of George Moscone, then-majority leader of the California Senate (he went on to become mayor of San Francisco mayor and served until he was assassinated in 1978). Pfund testified about her research in Sacramento, bolstering a bill to require transparent pricing from the state's gas stations. "We did that, and it passed, and now you take it for granted because all gas prices are posted," Pfund explained. "That was an early success -- it was something that gave me confidence that policy could be used for a good purpose." The willingness to step into policy debates didn't come once Pfund had millions of dollars at her disposal; it developed before she even graduated from college. She didn't let people write her off for other reasons later in her career, like being a woman in the male-dominated fields of venture capital and cleantech. That issue came up when she went out to raise her second fund with colleague Cynthia Ringo. "People noted, 'Wow, we've never had two women here before. Do you have any men?'" Pfund recalled. That didn't faze her, though. "[Having started] in the semiconductor industry in the '80s -- compared to that, venture was like a sorority," she said. Before she became a VC, Pfund worked at Intel as a speechwriter for co-founder Bob Noyce. That was rewarding work, she said, because Noyce's prominent public stature meant the ideas he spoke about could reach a lot of people. After a couple years, she was ready to move to a new job, preferably in San Francisco to avoid the lengthy commute down to Silicon Valley. In those days, there weren't any tech jobs in San Francisco, but she discovered a venture capital firm that drew her attention. The only trick was nabbing a meeting with the boss. Pfund took an unconventional route. Since the tech industry was growing up and becoming increasingly nationally relevant, she proposed Intel host a party at the upcoming Democratic National Convention. "It will be the coming-out party for the tech crowd, [showing] that we know what the Democratic Convention is and we actually understand politics, and then we'll do one for the Republicans," she recalled. Such events benefit from well-placed partners, so she suggested inviting a co-chair. For that role, she nominated a politically active San Francisco technology financier, who was well-connected in Democratic politics. "I had a work purpose to do it, but my real purpose, which of course no one knew at the time, was that I wanted to meet Bill Hambrecht because I wanted to go work there," Pfund said. The party was a success on multiple levels. "I met Bill Hambrecht at this party, and at the end of the party I said, 'I'd love to come and talk to you and learn more about what's going on at Hambrecht & Quist,'" Pfund said. "He said, 'Sure.' And that's how I got my job -- I got the ability to go have a meeting with him that then resulted in a job." Pfund joined Ham­brecht & Quist in 1984, and later spun out her double-bottom-line investing from there. Pfund entered venture capital after several stints in the policy world. After her brush with energy legislation in college, she interned at the Sierra Club in Washington, D.C. She also studied the impact of biotechnology on the future of California, gearing up for a role in Gov. Jerry Brown's futuristic Office of Appropriate Technology (it was discontinued by his successor before Pfund could join). When she became an investor, she brought that broader awareness of the legislative and regulatory frameworks that young companies must operate within. "My interest in policy, which is not really that common in the VC industry, helped a lot," she said. "I was able to very clearly see that certain policies would result in certain markets being attractive, and then jump in and try to help shape policy. You never win at that 100 percent, but you can certainly make a difference." That stance fits with her investor-as-activist ethos: if you're investing in companies that produce a social benefit, why not push for a policy regime that encourages those results too? The policy lens guides Pfund in selecting investments, too. She uses her understanding of policy problems to form a theory of what services and business models will be needed to solve them. "We follow the carbon in our investment thesis, and then we look at 'fix something that's broken,'" Pfund said. "And if the incumbents are 100 years old and there are no new names, it's time to invest." A word from our sponsor: This podcast is brought to you by Fiveworx, a turnkey customer engagement platform for utilities. Find out more about how Fiveworx can help your customer engagement program succeed -- and get you beyond the meter.